WhatsApp Business App Now Live with APK File! WhatsApp Business is finally got into the testing stage and even APK is now available online. This is a separate app and will not be an extra feature in existing as many expected. WhatsApp has been working on a Business version of the app for quite some time now. The business version aims at small and mid-size businesses and how it can effectively help to communicate with the customers. After multiple leaks, Whatsapp Business app has finally reached the testing stage. The APK file of the WhatsApp Business App is available now, and one can download the app and official testers are already into the testing of the app. 1 Where to Download the WhatsApp Business App? 2 How to Become a Tester for Whatsapp’s Business App? 3 How the Whatsapp Business App Works? 4 How will it Aid Revenue Generation? Where to Download the WhatsApp Business App? For now, the Whatsapp Business app has been made available for download as an APK file and is being presently tested by the early testers. APK for WhatsApp Business is listed on the APK Mirror, and the users can try out the Business version of the Whatsapp app if their business has been approved for testing. Only businesses been approved via the early survey can access this new separate app for the time being. How to Become a Tester for Whatsapp’s Business App? BookMyShow (BMS) in India has earlier confirmed that they have partnered with Whatsapp’s Business program, and they sent out ticket updates through their the app to the customers. Though the WhatsApp Business app is ready for download, the details about how the app will work are already out in the public domain. How the Whatsapp Business App Works? The Whatsapp for Business app will function someway similar to the normal Whatsapp app. The users of the Business app can manage a personal and business WhatsApp account and can can run the personal and business WhatsApp simultaneously. Users need to register for the WhatsApp Business app, and then they need to transfer all the business contacts to the WhatsApp Business app. This will separate all the personal conversation, and one can use it for all business purpose. Users need to register using a different phone number for the WhatsApp Business. 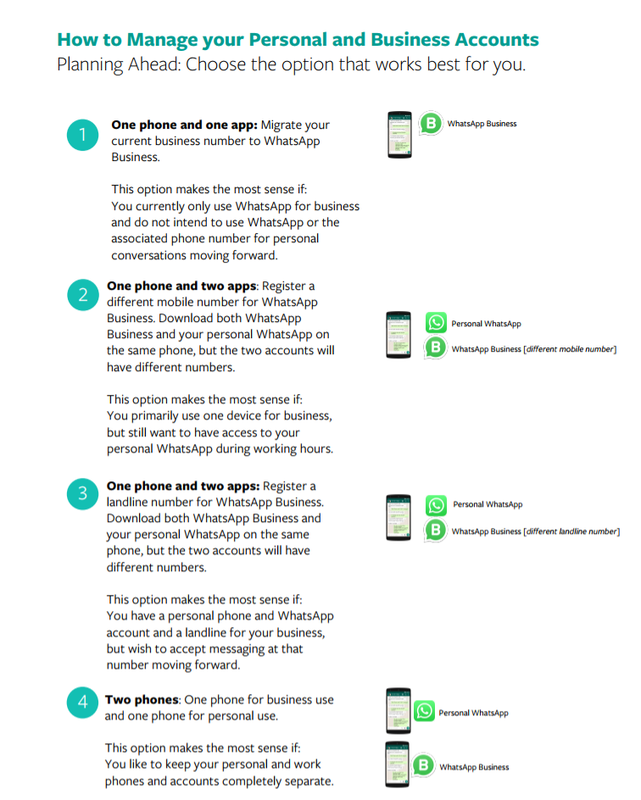 The WhatsApp Business app and the official WhatsApp app are separate, and users to register with different number for the different accounts. The messaging platform for the businesses version can be registered with landline numbers. This isn’t currently available on the original Whatsapp app. In a market like India, this landline number feature would turn out to be really useful for the small businesses and enterprises, owing to their dependency on landlines. Presently the actual Whatsapp app is only limited to the Messages sent, received, delivered and read. But on the Business app, there are options to set up the business details like website, address and other information. You can include location, categories/tags, a brief description of your business, an email address, and websites (one or many). The categories are quite extensive so technically you should find something to describe your business profile. How will it Aid Revenue Generation? WhatsApp earlier indicated it would charge the larger enterprises for the Whatsapp Business App, though will remain free for smaller business and medium sized enterprises. Given their 1.2 billion user base, this will mean a big change. Their new business angle could be a big revenue source for WhatsApp, which is the largest instant messaging app in the world. India has over 200 million active users Whatsapp users. India is a breeding ground for fake scams and false marketing schemes. If WhatsApp works well to keep away the users from the potential spams, the Whatsapp Business App could be huge success in the country. "WhatsApp Business App Now Live with APK File - Everything You Need to Know! ", 5 out of 5 based on 12 ratings.